A New Mac Tip Every Day: A workaround for a bug in the dictionary! I know some people might say that it is not a bug, but I think it is really annoying and it shouldn't be made this way. When you search a word in the dictionary it often redirects you to another way of writing the word (or if you search for an adverb, it redirects to an adjective or a noun) and that's fine. That's how dictionary works. An example of it is if you search "multicolor", it redirects you to "multicolored". I have no problem with that. 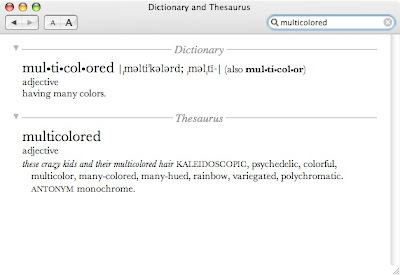 The problem is that when you search "multicolor" and it brings you to "multicolored", it only displays the dictionary results of "multicolored". The thesaurus results are nowhere to be seen. 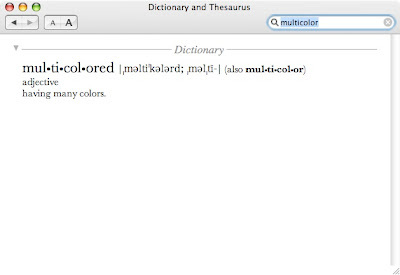 When you search "multicolored" however, both the dictionary and the thesaurus results appear. So the best way of doing it is that when you search for something and you are redirected to something different, and you want the thesaurus results, search for it again by entering the exact word that it redirected you to. You also should consider that Canadian and US spelling is also different for a few words, such as colour (Canadian spelling) and color (US spelling). (just wondering) Do Britons spell it "colour" as well? I didn't even know Canadians do. I thought that was just an arcane way of spelling it. Either way, thanks for the tip, even though I've already figured this one out the hard way for myself. I thought it was just my mac being screwy. I love "A New Mac Tip Every Day"! As a computer science & electrical engineering major I'm ALWAYS on my mac so these tips and shortcuts are an amazing benefit, especially with the dashboard widget. Thanks again! we use british spelling in australia as well. did you know that jail was originally actually spelled 'gaol', and still is in australia, uk, canada etc? Actually, in Canada we favour the "jail" spelling as we have a colourful fascination with something called hockey where the number of goals in a game determines the winner and it should not be confused with gaol. I dig Mac Tip! I am a Graphic Designer, so I am working on my G5 all day. These tips have been very helpful to say the least. Especially with the widget. Keep it up! Talking of which, does anyone know of a widget that directs to a British dictionary/thesaurus? This same problem happens when you CLICK on a word to see its definition -- it brings up only the definition not the synonyms! Anyone know why this is so or a way to actually make it bring up the Thesaurus WITHOUT re-typing?? The default American dictionary is a big gripe of mine. Is there a UK/International English plugin for Dictionary? There are a lot of American words which differ from the UK English, which are far from arcane! When you search for a word, don't hit enter or return. You will get a list of dictionary entries that contain the word (multicolor or multicolored). Double clicking the word will take you to the dictionary entry. Double-clicking multicolor takes you to the entry for multicolored, but there's no thesaurus word because there's no thesaurus entry for multicolor. However, you don't need to retype 'multicolored': just click on the back button, and double-click on 'multicolored' and there is the thesaurus entry. PS You can double-click any word, even within the definition or thesaurus, and get the entry for that word.